Queen of the Black Coast is one of Robert E Howard's best Conan stories. When Wood's story works it works well. Cloonan and Shalvey's art is impressive if contrasting in style. Massimo Carnivale's chapter break art is glorious. 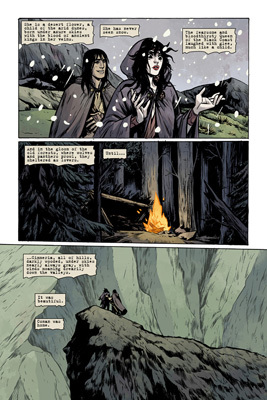 The Death finds Conan returning to his homeland of Cimmeria with his lover Belit; his past comes back to haunt him in the bitter and rugged landscape of his former home, and Conan finds himself faced with a tough decision. Bêlit sees snow for the first time. 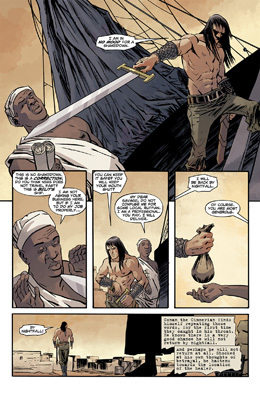 Brian Wood is the latest of several writers to tackle Conan, and this time is an adaptation of Robert E Howard’s Conan story Queen of the Black Coast. This story is of the most revered tales by Howard, as it introduces Bêlit, a fierce pirate queen feared throughout the land- and one of few memorable female characters in the Conan tales. The Death (and the preceding volume Queen of the Black Coast) have a distinctly different approach to what has featured in Dark Horse’s Conan previously. The first of these changes is that Conan is younger than previously portrayed, with the exception of his appearance in Born on the Battlefield. It should be noted there is no definite chronology for the Conan stories- although a variety of academics and writers have created them by piecing together events from the stories. Another big difference is the art from Becky Cloonan, Vasilis Lolos and Declan Shalvey… but more on that in a moment. One of the biggest love-it-or-hate-it changes to be found is that a lot of what happens in this volume seems completely at odds with the ‘sword and sorcery’ setting. This latest story is essentially just ‘sword’, which is really at odds with the inherent charm and fun of Conan. Whilst adding an element of realism (there are no mysterious artifacts, revenants or other supernatural beings here) can be seen as a different approach it can also be seen as fixing something that wasn’t broken, and as the story unfolds it’s the latter rather than the former which comes to mind. A lot of what happens here seems a lot like a clumsy attempt to fill out some story before getting to Queen of the Black Coast’s conclusion- which I won’t spoil for those who haven’t read Howard’s story. rather rushed. Aside from some family drama and some fish out of water developments for Bêlit it all seems like a non-event before the next part of the story. The later chapters of this volume work a lot better, with Bêlit and Conan’s relationship being a core element of the story, and everything working far better than the clunky preceding chapters. A further problem is Bêlit herself; there’s never any real sense of why her name would strike fear into hardened sailors in Wood’s adaptation. There’s never any indication that she is a fierce and dangerous warrior- unlike in Howard’s story, which really comes to the fore in the conclusion of the previous volume. This robs the character of a lot of her appeal, with this version of Bêlit definitely not living up to the description of “the wildest she-devil unhanged” . As for the art, Becky Cloonan handles things well. despite having a style far removed from the ‘traditional Conan’ most will be familiar with (see Massimo Carnevale’s sombre brooding cover for an example of that) a highlight being a great full-page close-up of a glowering Bêlit huddled over a fire. Vasilis Lolos however doesn’t fare well at all- Conan looks both feminine and childlike in numerous panels, Bêlit -despite being so stunning she literally entrances Conan on their first meeting- often looks plain ugly and action scenes come across as a confused mess. Declan Shalvey, on the other hand, handles things impressively well; the first few pages contain a total of 20 words and yet are some the best pages in the book due to Shalvey’s composition and character design. Furthermore a double page spread of a blood soaked Conan sat resting against the door of Bêlit’s chamber aboard the Tigress, sword by his side, is another great image which evokes a great sense of atmosphere and forboding . After years of consistency from several writers and artists, Dark Horse’s Conan is now a somewhat hit and miss affair. It’s still a decent read, but it’s just not up to the usual standard.